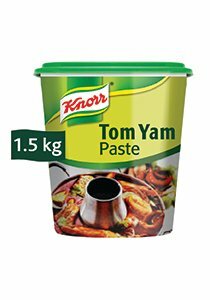 Knorr Tom Yam Paste is prepared from traditional Thai recipe. The ingredients are carefully selected for the authentic Thai Tom Yam aroma and taste. • It is suitable for preparing any Tom Yam soup and spicy dishes. • Right product for the Thai Papaya salad. • Obtain perfect blend by adding touch of Tom Yam with Fish Ambulthiyal.